Perseverance. It’s a prerequisite for any great story of triumph. In order to truly achieve a grand victory, it seems almost necessary for the victor to have overcome varying degrees of obstacles and long odds alike. In the case of the 2016-2017 Lady Bulldogs, perseverance is found in abundance. The Allan Hancock College women’s basketball team made it to the playoffs this year for the first time in 10 years, a serious achievement that took resolve and discipline. One example of those traits came from assistant coach and cancer survivor, Larry Carney. Carney takes part in the The Coaches vs. Cancer program, which started in 1993 as a national venture between the American Cancer Society and the National Association of Basketball Coaches. For the past three years, Hancock has held its version of the event, named for Coach Carney: The Carney Coaches vs. Cancer fundraiser. The third annual installment of the event raised $3,551 for Mission Hope Cancer Center in Santa Maria, more than three times the amount raised in 2016. 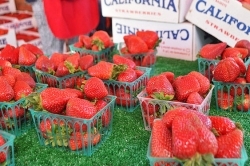 In addition to the games, money was also raised through a crowd-funding site online. The campaign received donations from as far away as Denver, Colo.
Carney himself has battled cancer for more than three decades and recently began his fourth bout with the disease. He has seen the effects cancer can have firsthand, first losing his father, then his mother, and brother. 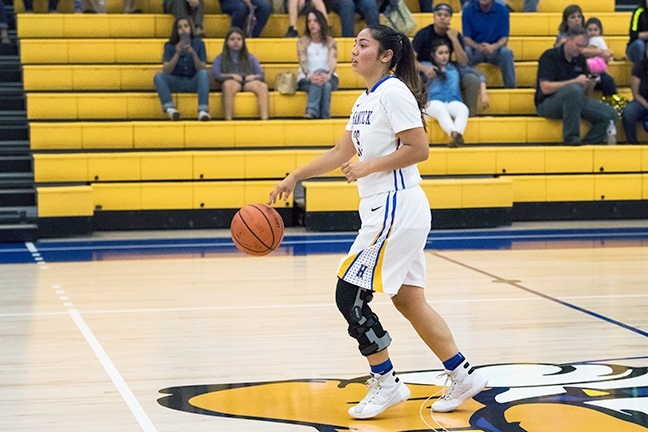 Lady Bulldogs point guard Syenna Ramirez sustained an injury with just three weeks left in the season this year. Still, he has endured and continued to coach with a smile. The student athletes on the team had to learn to deal with adversity this year as well. In the end, they showed that the example set by their coach was not lost on them. Early in the season, the Lady Bulldogs lost a couple of games that head coach Nerelli thought they should have won while being outplayed by their opponents. Then, with three weeks to go in the season and the playoffs looming, an injury struck the team. Ramirez was injured in the Feb. 8 game against Moorpark that highlighted Carney’s Coaches vs. Cancer Night. The Lady Bulldogs would lose that game along with the following one to Santa Barbara City College, and it appeared as though their hopes for the playoffs would be put on hold for another year. Yet, under the guidance of coach Nerelli and coach Carney, the team persevered, winning two of their last three games and cementing a spot in the California Community College Athletic Association’s (CCCAA) playoffs. 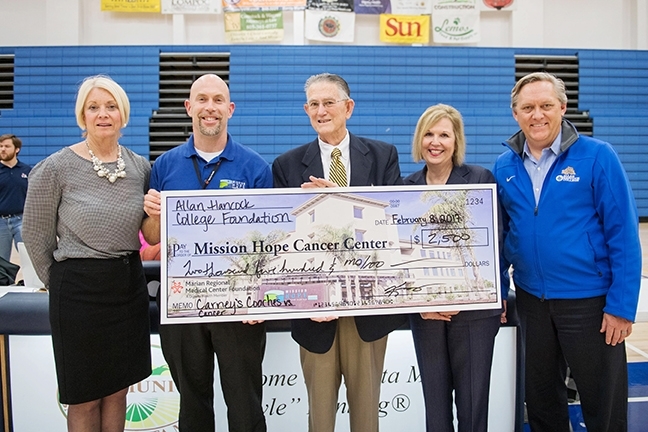 Allan Hancock College’s Women’s Assistant Basketball Coach Larry Carney (pictured center) presented a check for $2,500 to the Mission Hope Cancer Center at Hancock’s annual Carney’s Coaches vs. Cancer fundraiser. Hancock’s Women’s Basketball Team last made the CCCAA playoffs in 1995. Coach Carney’s daughter, now a teacher and coach at Pioneer Valley High School, had been a member of the team that year. When Nerelli decided to take the job as head coach five years ago, it was clear he too would have to overcome long odds in order to achieve the success the team had back then. Nerelli was a highly successful coach at Morro Bay High School for more than 25 years prior to taking the job at Hancock and knew he would have his work cut out for him. The Hancock women’s team had finished 4-22 the year before Nerelli arrived, including a 14-game losing streak to finish the season. Yet in the four years that followed, Nerelli progressed the team to this point, where the playoffs seem to be a very real possibility. The Lady Bulldogs lost in the opening round of the playoffs on Feb. 22 against Santa Ana City College. Although the loss was bitter, the program appears to be heading in the right direction and expects to have the several key players returning. Contact Sports Contributor Jason O’Neill through Managing Editor Joe Payne at jpayne@santamariasun.com.